Avant Window Navigator (AWN) isn't just a pretty launch bar: add a couple of applets and you can use AWN to read RSS feeds, monitor system resources, and even manage tasks and to-dos. The latter is possible thanks to two applets: Remember The Milk (RTM) and To-Do List. As you might have guessed, the RTM applet provides a simple interface to Remember The Milk -- probably the most popular and innovative Web-based task manager out there. Using the applet, you can view and edit existing tasks as well as add new tasks right from AWN. If you prefer to keep tabs on your to-dos using a standalone utility, the To-Do List (TDL) applet is for you. While it won't rival a dedicated task manager, TDL includes all the basic features that can help you to manage your to-dos with minimum effort. When creating a task, you can assign it a priority, add a brief description, and specify the completion status. TDL also lets you create categories which you can use to group your tasks. For example, you can create the Work and Personal categories, so you can keep your private and work-related to-dos separate. Despite being a rather basic task management tool, TDL does have a few nice touches. 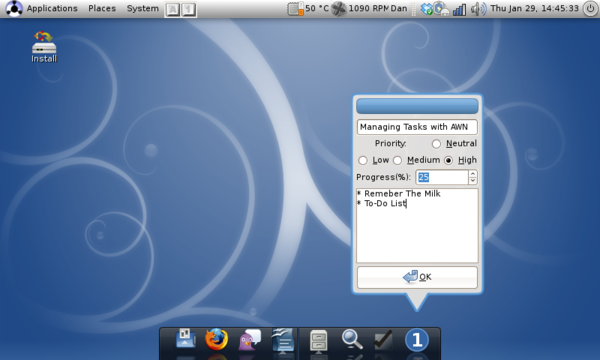 For example, when you populate TDL with tasks, the applet's icon displays the number of active tasks. The applet also uses color codes to make it easier for you to visually identify tasks' priorities. Finally, a tiny icon next to each task in the list displays the task's completion status.